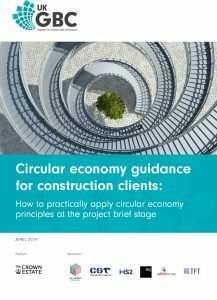 UKGBC has been working with its members and the wider industry to develop practical guidance which enables organisations working in the built environment overcome the barriers to implementing circular economy principles. ASBP is a supporter of UKGBC’s Circular Economy Programme with our board member Graham Hilton sitting on the programme’s working group. ASBP patron member Cleveland Steel & Tubes Ltd are a key sponsor for the programme. Our recent Re-usable Buildings – Climate-KIC Pathfinder Project is featured on a web based actor and resource map of circular economy initiatives and government policy within the built environment.